Introduction: Here you will find a small reference list of miscellaneous vintage tackle items that can be had for a price in the market today. There is now doubt that some of these items are really beautiful. An interesting and rare catalogue of fishing items from the famous retailers and makers of gold hooks T. H. Sowerbutts and son which probably dates from the 1920`s/30`s. The catalogue has an orange card cover and 104 interior pages packed with line drawings and litho prints of fishing rods, reels, tackle, and equipment (even a page and price list for fish mountings). The catalogue measures 8 1/2" x 5 1/2". The catalogue was printed by S. TINSLEY & Co. Ld. 60 WORSHIP St. LONDON E.C.3. The catalogue is in very good condition for its age, it has some small damage to the top staple due to rust, really hardly noticeable, but otherwise in great condition. A large format (A4 - 11" x 9" ) ALLCOCKS TRADE CATALOGUE, List No.35, undated but certainly 1930's. It is in excellent condition, complete (175 pages), bright and with very few signs of use. Unlike the smaller abridged catalogues that come up from time to time, this contains the complete range of pre-war Allcocks rods, reels, lures, flies and all the other gadgets we collectors love to find and identify. It also contains 2 letters from Allcocks dated June 1939 and as these trade catalogues were only re-issued occasionally certainly dates it to pre 1939. This a scarce and very collectable reference work. A Good Hardy 1934 Anglers guide, 446 pages, cover ,spine, and inside all in good condition. S. Allcock & Company Limited, Standard Works, Redditch England 1937-1938. Very scarce in this condition, a vintage English catalogue containing nearly 200 pages of angling equipment with hundreds of descriptions and 1938 prices with over 400 illustrations and 3 pages in colour, interspersed with information and articles on fishing with illustrations and a four page history of the company founded in 1803 with photographic illustrations. 219 pages in total. CONDITION: Original paper covers with slight creases to front cover corners and slight wear to spine paper, inner staples slightly rusty, pages are clean and all complete. Size is 8 by 5½ inches. A copy of Hardy's Angler' Guide and catalogue, believed to be published circa 1956. An illustrated period catalogue of the well known fishing tackle manufacturers. Hardy Bros (Alnwick) Ltd, Alnwick, England. Approx 8 1/2" x 5 1/2" x 1/3". Paperback, used good condition for its age. Farlow & Co. Anglers Guide and Catalogue 1960 very good condition. Loads of interesting illustrations and features, lots on the different Charles Ritz Parabolic series, including the Sawyer Nymph, Sawyer Still Water, Fario Club, Power Plus Creusevant, Ritz, Skish, Speciale Normale, Supreme Normal. All the usual colour plates of flies - include one of the Arthur Ransome series of flies The catalogue is in very nice condition. A good copy of the quite scarce 1960 Hardy Bros catalogue. Loads of interesting illustrations, lots on the new lightweight reels, Exalta, Perfect (inc scarce Taupo variation), St George (inc Junior), St John, Elarex, Silex Superba etc. in this 160 page catalogue. All the usual colour plates of flies. Good item on fly lines by Capt. T.L. Edwards. Flies by William Mills & Sons - thought to be from the 1920s. A fine collection of 50 English vintage floats that represent years of collecting, in brief 2 Allcocks fishing gazette with labels ,1 Tays patent, labelled ,1 quick release float, 2 very early pike floats with original bobbers attached,13 yellow Harcorks, all named ,next 9 Allcocks celluloid floats, 2 double cockers, and 6 Zephyr's all good some mint complete with display box. A stunning Hardy fishing tackle box in leather and brass in outstanding condition throughout, tan leather and gold stitching brass buckles and latch and bass studs all in super condition. The total box size is 16" long, 11" wide, 8.5" deep, 41 cm, 28cm, 21.5,cm, inside is lined with a removable tray, which exposes the 3 compartments, which are all around the same size this is a totally stunning piece you may never find another in this condition not tampered with totally original. Classic vintage landing net in good condition - definitely the sort of landing net that would have been used by Mr Crabtree. A simply stunning dark grained wooden hoop landing net and tonkin whole cane pole. Beautiful peardrop light weight dark wood landing net hoop (opening is 26 inches long x 19 wide) and suitable for all but a record carp. Will handle double figure barbel and twenty pound plus carp, but not too big for more modest sized species such as chub and bream. And certainly not out of place come June 16 by a lily fringed lake full of bubbling summer tench. Pear drop hoop with brass screw fitting block is fitted with modern knotless net. Comes complete with brass fitted superb whole cane tonkin pole 65 inches long supplied by Chapmans of Ware, with nodes deliberately left slightly proud to provide traditional un-straightened look and feel. Node whipped in fine B James style burgundy silk, to complement your Mk IV, and fitted with brass screw thread barrel and black rubber end button. A superb outfit for all traditional angling enthusiasts. Similar size traditional hooped nets can cost up to £450. And without doubt the best shaped net for poking into marginal weed and lilies to win your fish...there is no draw cord to foul or fold up on you. A really stunning set of old plates. 6 plates measuring about 23.5cm across, and one larger one measuring 35.5cm long,28cm across, the quality looks like Worcester as the design really stands out with the bright green border, they also have a really beautiful raised design gold gilded borders. Script going round top just inside reads FRIEND WHO IS MORE WELCOME TO MY DISH THAN TO MY ANGLE WAS MY FISH. All the green banding seems free from wear. No apparent scratching or colour loss. There is minor general crazing. There is a faint Doulton impressed mark on the rim of the base. 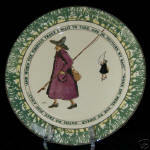 It's a great item that will enhance any Royal Doulton or angling collection.